Twisted Cedar 2015 Lodi Cabernet Sauvignon has concentrated aromas of vibrant ripe berries with a trace of chocolate. The aroma mingles with flavors of fresh cherry and dark blackberry notes which are balanced by a mellow spice from nine months of oak barrel aging. Certified sustainable through Lodi Rules for Sustainable Wine Growing, Twisted Cedar wines reflect a commitment to quality wine and responsible stewardship. The Twisted Cedar name honors the Cedar Band, one of 5 Bands of the Paiute Indian Tribe of Utah, named after the cedar tree that heavily populated their land. Dedicated to being good stewards for Mother Earth, these fine wines are a tribute to a proud people. Certified sustainable through The Lodi Rules for Sustainable Wine Growing. Aromas of ripe berries with a trace of chocolate. Aromas mingle with flavors of cherry and balanced spice from nine months of oak aging. The Twisted Cedar name honors the Cedar Band, one of the 5 Bands of the Paiute Indian Tribe of Utah. An Elder of the Band blessed Mother Earth and the vineyard, that it would nourish and produce healthy vines, flavorful grapes, a bountiful harvest, and the finest of wines. 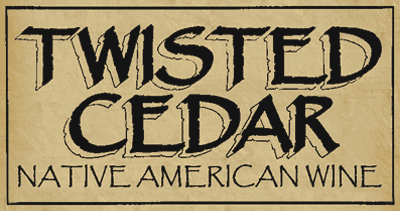 The Twisted Cedar wines are a tribute to a proud people. We are honored to offer these wines for your enjoyment.